Work continues on the new Friedman Jewish Community Center, located at 613 Third Avenue in Kingston. 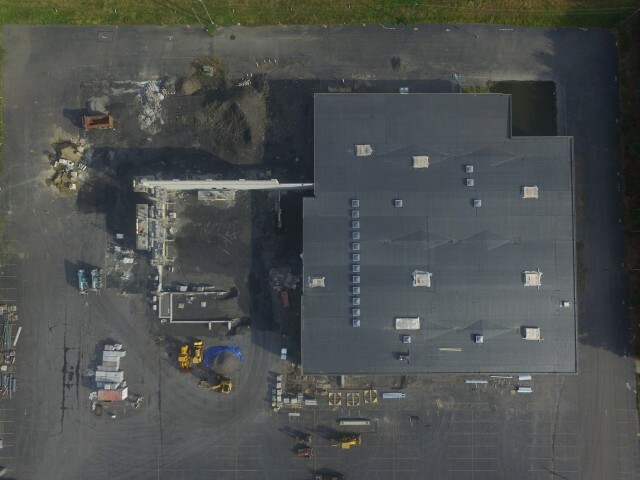 The drone photos to the left, taken by Harrison Kayton, JCC Media Intern, show the progress of the building. The exterior of the main building is nearly complete and work has commenced on the gym building. We are planning for occupancy in early 2019. 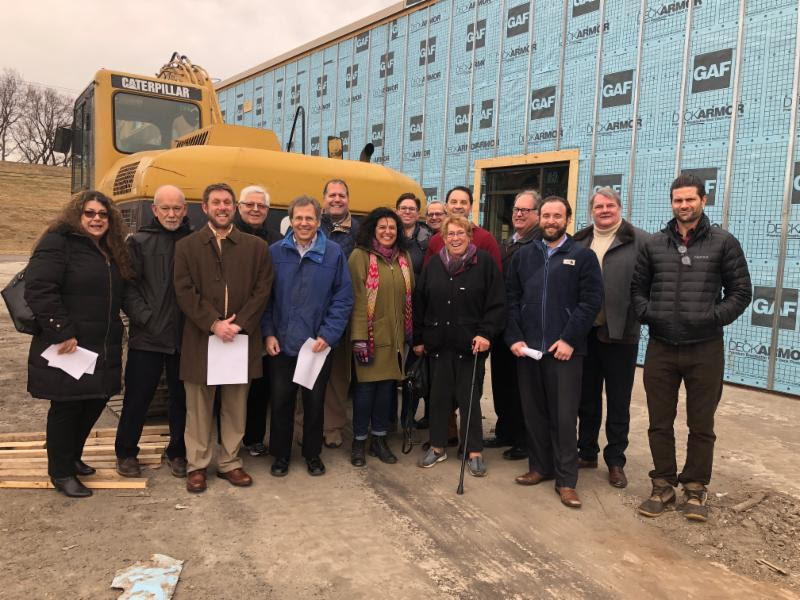 Members of the Board of Directors of the Jewish Community Alliance and JCA Staff toured the Friedman Center for Jewish Life on March 20. Despite the chill, the group was all smiles at the great progress of the building. 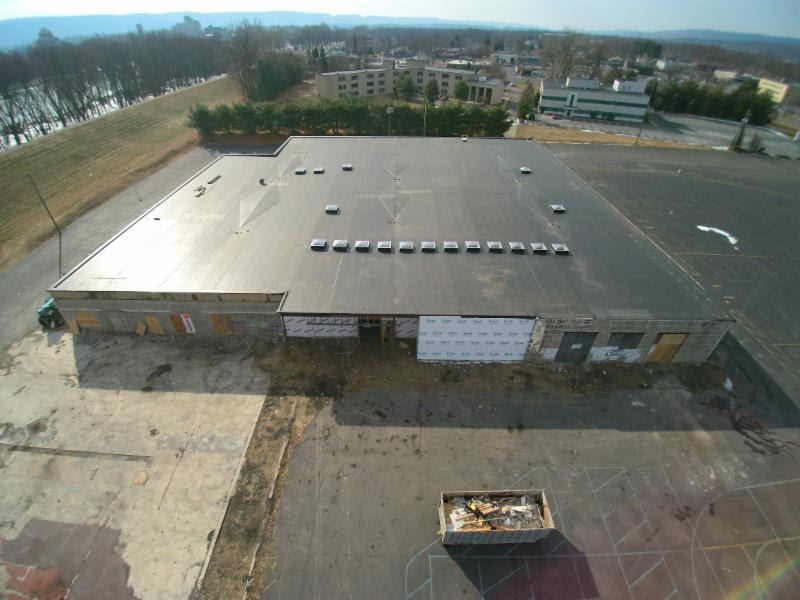 They saw where the multi-basketball court gymnasium will go, the fitness center, the locker rooms, the state of the art steam room, the administrative offices, the Early Childhood Center and outdoor playground, the kitchens, the tallis-weaving room, and the rental site. Pledge reminders recently were sent to donors to the Capital Campaign and the next round of solicitations is beginning. If you haven't yet made your gift, please contact Len Zimmerman via email or at 570.824.4646 or Paula Chaiken via email or at 267.664.0491. 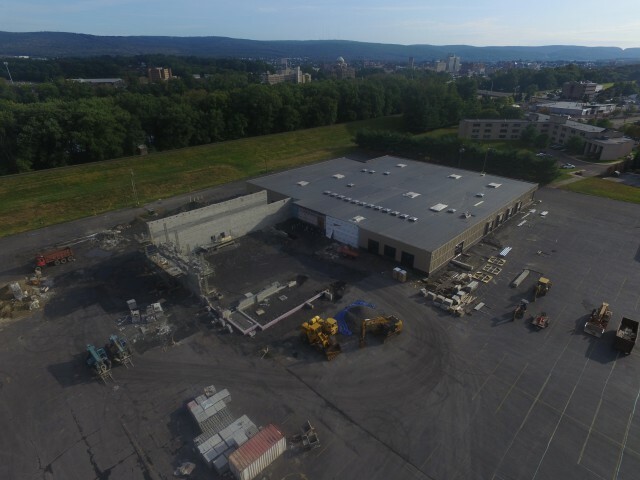 Len and Paula and the members of the Capital Campaign Committee look forward to meeting with you and helping you support our community in this exciting next step for Jewish Wilkes-Barre. The new roof has been installed on the Friedman Center for Jewish Life at 613 Third Avenue in Kingston. This investment in our future will prevent the deterioration of the building and has been funded by the state of Pennsylvania through an LSA Grant. Construction Manager Bob Becker states, "I'm impressed with the speed that this new roof was built and the quality of the construction. 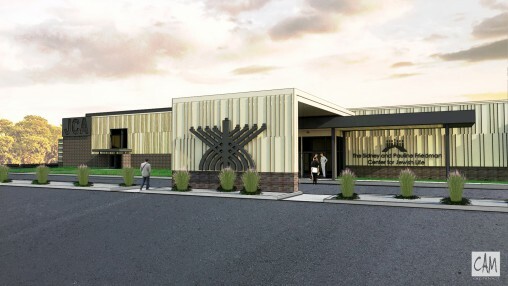 It includes 19 skylights and will serve the Jewish community for many years to come." Check out these photos and video of the new roof! The next phase of the project includes resurfacing the facade, and installing a state-of-the-art LED sign along Third Avenue. We hope this phase of the project will be completed this spring and interior work will commence following that. Our construction bridge loan was approved thanks to First National Bank of Pennsylvania. We have meetings scheduled with foundations in the coming months as part of the second phase of our Capital Campaign. We hope our community, alumni, and friends will support this exciting project.